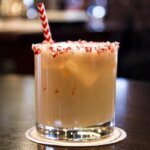 Four Seasons Hotels and Resorts just launched their year-long Cocktail Quarterly campaign highlighting mixologists’ takes on cocktail trends, the first theme being the Old Fashioned. From August – October 2015, the classic Old Fashioned will be celebrated with a wide array of flavors, styles and techniques. 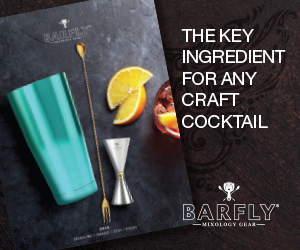 Some notable variations highlighting expertise and dedication to high quality ingredients and innovation include the cocktails below. 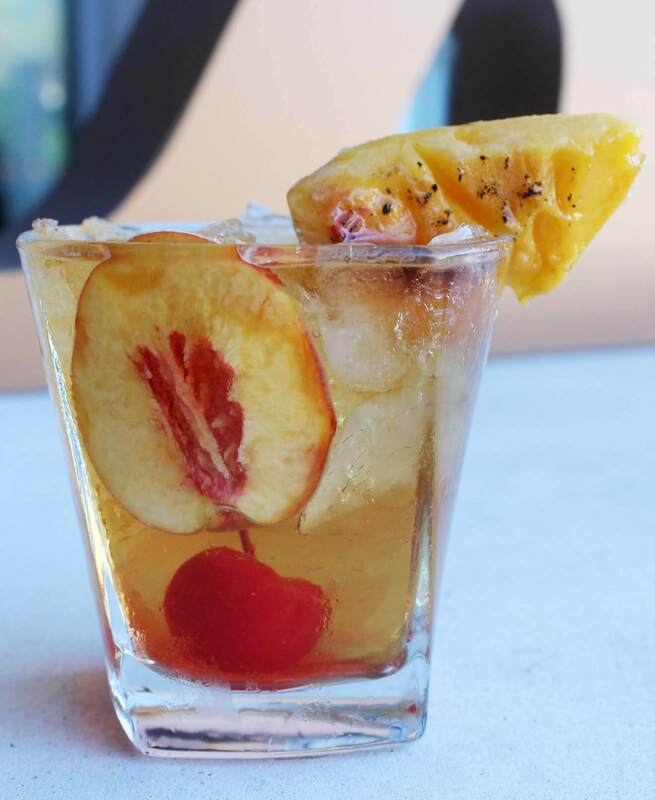 Using locally-sourced peaches from a nearby farm, in one of the healthy recipes from the nutrition team at its on-site wellness facility, California Health & Longevity Institute, this cocktail gives the traditional Old Fashioned a natural sweetness with less added sugar. Preparation: Muddle peach bitters, grilled peaches and orange wedges in a mixing glass. 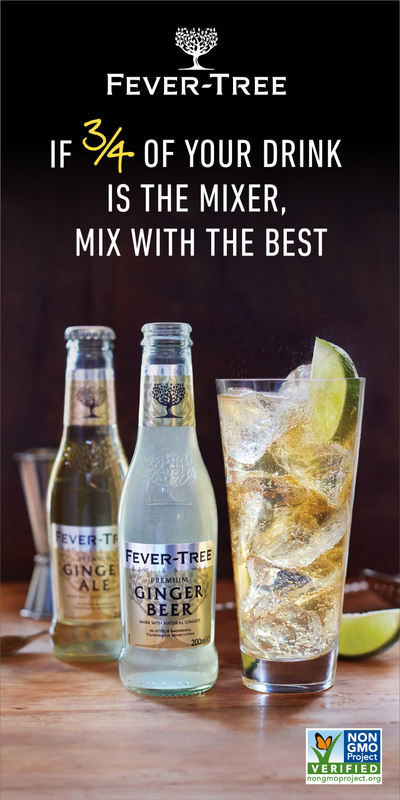 Pour in bourbon and crème de peche, fill with ice cubes and stir. 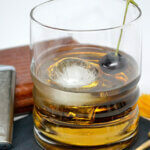 Strain over a large square or sphere ice cube in an old-fashioned glass. 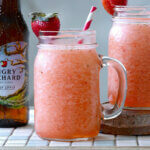 Top with 2 splashes club soda and garnish with a Luxardo cherry. Preparation: Preheat lightly oiled grill to medium-low heat. To blanch the peaches: Bring large pot of water to a boil. Score the bottom of each peach with an X. Put peaches in boiling water for 2–3 minutes. Use a slotted spoon to remove and place in an ice water bath. Remove skin with a paring knife. Cut peaches in half and remove pits. Place sugar in shallow bowl. Roll peaches in sugar, shaking off any excess. Grill peaches until sugar is melted, about 3–4 minutes. Turn over and continue grilling for 3 more minutes. Brush amaretto on peaches (peaches will flame for a few seconds). Preparation: Mist and drop orange peel into mixing glass. Add bitters. Add brandied cherry, Quick muddle. Add ingredients 1&2. Stir with ice and Strain. Garnish with orange peel, candied bacon strip and brandied cherry. 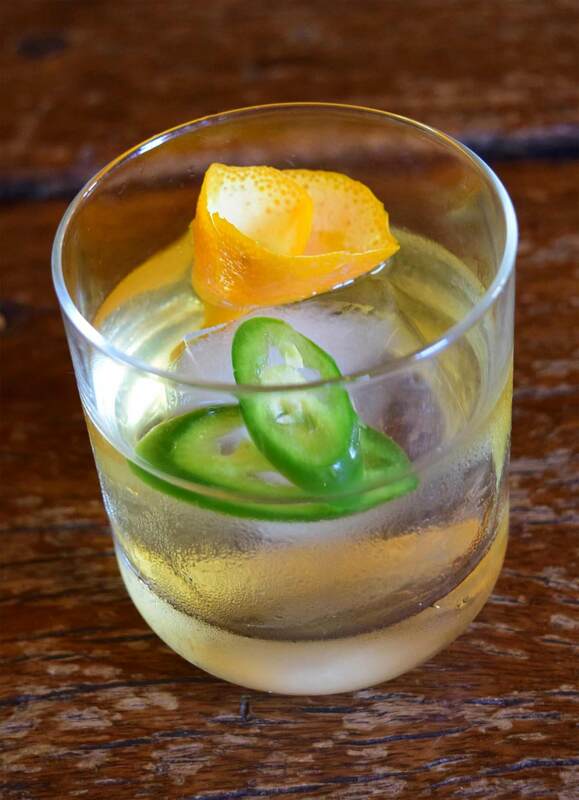 Created by Lounge Bartender Sarah Rahl, The Smoking Gun is inspired by the smoky and spicy flavors of Traditional Texas cuisine, including BBQ and Tex-Mex. 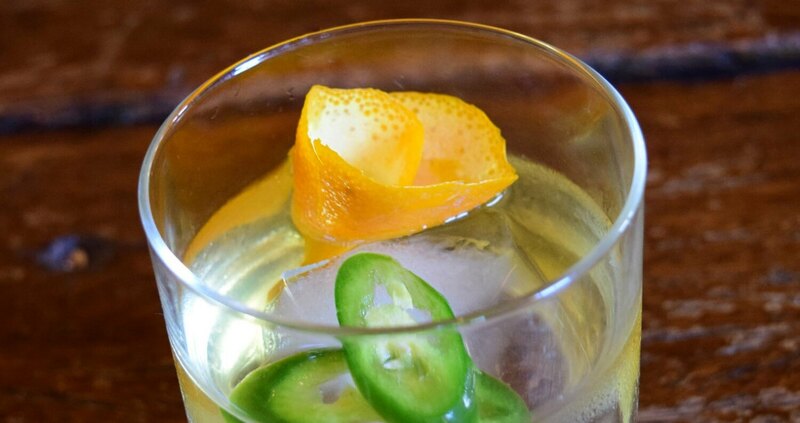 The cocktail follows the traditional proportions of an Old Fashioned, substituting the bourbon with increasingly trendy Mezcal. 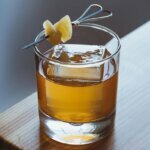 This play on an Old Fashioned is reminiscent of a spicy margarita and we all know Texans love their margaritas! 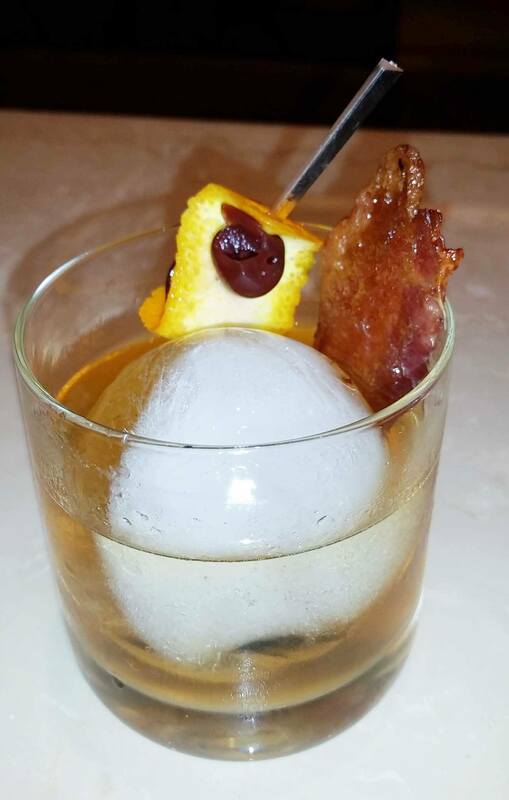 Preparation: Served in a rocks glass over large ice cube. Garnish with flamed orange peel slice of serrano.